Paczki Day, (pronounced POHNCH-kee) is a Polish tradition honoring the beginning of gluttony week. We celebrate on Fat Tuesday each year although traditionally begins on Fat Thursday across the pond. This is the last day to load up on any fatty foods and sweets before the start of Lent on Ash Wednesday. 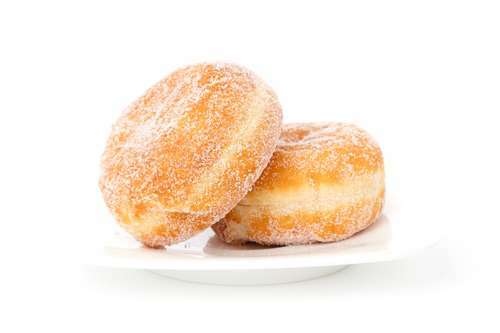 In Poland, Paczki Day is celebrated a bit differently however, almost everyone can agree that eating at least ONE of these rich doughnuts will bring you good fortune. And the best part is; even if you’re not of Polish decent, you can still participate in the fun festivities surrounding the day by enjoying a Paczki. A paczki, by tradition, is a round shaped doughnut filled with jelly of some kind. These doughnuts are often baseball shaped and made with a dairy rich dough. This stems from the effort cooks put into using up their perishable dairy supplies before Lent. They can be filled with many jellies or combination of jellies to suit one’s pallet. Traditionally, paczki were rolled in granulated sugar or covered in glaze. However, these days, you may find them dipped in icing, rolled in powdered sugar, or left plain. Paczki Day is one of our favorite days in terms of filling donuts with a variety flavors. We do tweak the rules a bit here in the bakery. Our doughnuts intertwine old and new ideas. We have a few traditional finds, such as prune and raspberry as well as new fillings like strawberry/cheese and vanilla. Other filling options include blueberry, lemon, apple, apple/cinnamon, pineapple, chocolate custard, custard, apple/raspberry, fig, cherry, and others. With a variety of toppings and fillings, our store will be quite the buzz on Fat Tuesday. How do I get one of these delicious Paczki? Although we will have plenty made for the store, we strongly urge our customers to order ahead. By ordering ahead, you can insure you have enough paczki for your household. You’ll also be able to choose your flavor combinations. Kick off Lent with a Paczki! While celebrations commence honoring the beginning of Lent, bakers across the globe will be busy preparing paczki. We are no exception. We’ll be cranking out these doughnuts to be sure no one is left behind. An old Polish proverb states, “If you don’t eat at least one doughnut on Fat Thursday, you will not be successful in the New Year”. Whether there’s any truth to this being an actual proverb is left up to debate. However, in terms of eating a doughnut, what harm could there be in at least trying it? Our staff members are ready to take you call now. Simply call us at 9042461728 to place your Paczki order today! Spring in for Strawberry Donuts!